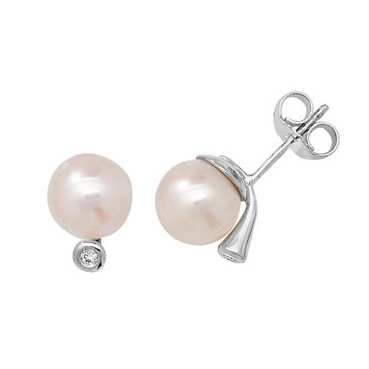 A stunning pair of pearl and diamond earrings, cultured pearls set with 18k white gold and 0.04ct of round cut white diamonds in a bezel setting. Standard post and butterfly fitting. Delivered free with luxury wooden gift box and a full 12 month guarantee. Click here for more information on this unique gem.